Nice traditional pub on the Green. Handy for station (less than ten minutes' walk). Surprised that, though a Greene King pub, it had three decent non-GK cask ales on. "The Cricketers" - I am quite amazed that no-one has reviewed this fine pub in the last 24 months...! Does no-one use this pub..?! I must admit, I don't, anymore. I was put off by inexperienced barstaff who didn't know the difference between a Chardonay and a Sauvignon Blanc (...they're white wines, for all the lager drinkers out there...!) and I also got fed up waiting at the bar trying to get their attention; and for other reasons which I won't go into, on this forum! Basically, you get better service, and better food, and better everything...at the pub next door!! So that's where I go, and it seems that's where everyone else goes aswell, now! I may be being harsh here, you may love the Cricketers, and its tiny dimensions. I could never get a seat when I wanted, let alone a table if there's more than one of you. They didn't favour decent white wine. And the last time I had a look in here, they weren't serving "Meantime Brewery" beers (from Greenwich) which is a very popular brand at the moment. However, in the summer, when the sun is shining & cricketers are cricketing on the Green immediately outside...I can see the pub would appeal to many! And why not, on a nice sunny day. But until then, I shall continue to use the best pub in Richmond, next door...! The Princes Head. Howzat..! decent fairly upmarket pub. amazingly posh location facing onto the green, but not pretentious itself. clean and bright interior, freindly service, decent beers. nice. 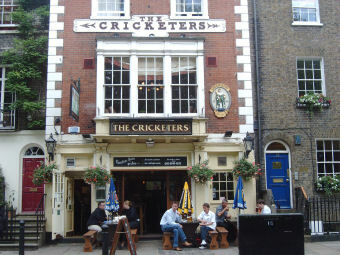 The Cricketers occupies a similar space in the imagination to concerned Richmondites as Iran might do to President Obama. It's a genuine threat to security and degrading to humanity but YOU JUST CAN'T GET RID OF IT. The problem is that it almost certainly makes an enormous amount of money, having what must be one of the best locations anywhere within Greater London, facing Richmond Green. The Cricketers' biggest crime is not the laughable food that gets microwaved round the back and served for �5 a pop to people intent on securing themselves a stomach ulcer. Nor is it the two fingered salute to beer drinking that constitutes its selection of ales. No, the biggest crime of the Cricketers is disappointment. It disappoints on every imaginable level. It looks beautiful from the outside but is stunningly, life denyingly generic inside: stale wooden panelling, mismatched colours, a quiz machine. For one, desperate, period it even had a Costa Coffee corner. Thankfully the staff appeared to have difficulty working the machine, so that got binned. The staff themselves know they are doing something wrong. They know they work in an establishment with the moral framework of Harold Shipman on a Saga holiday. That's why they're so rude. Their conscience is depriving them of the energy needed to be polite. They've seen too much, suffered too long. And then there is the TV. The cricketers can't even get TV right. TV only has a limited function in a decent pub. On the margins, Sky Sports pay per view can, just about, be justified. But, of course, the Cricketers doesn't need Sky Sports because people will walk in even if Beelzebub himself were pulling pints of children's blood. So instead of sports, one has the odd experience of watching rolling news channels, silently. Now this is all very well in the anteroom of an investment bank but in a pub? On Richmond Green? Really? The intention is to use television as a replacement for wallpaper. They couldn't think of a design scheme so they got Rupert Murdoch to choose the colours. That red white and blue works a treat! So really, what you're looking at when you look at the Cricketers is exploitation. It doesn't NEED to be any good. The managers could electrocute customers ever quarter of an hour and still meet their volume targets. 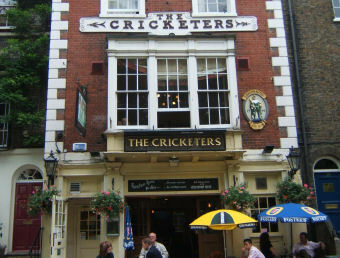 The Cricketers is a sap sucking weed in the fragile, decaying ecology of the Richmond pub scene. All the pretty flowers are blooming elsewhere, the Cricketers is turning Richmond into an ugly desert.